Keep Calm and Stamp On. My new motto. So there I was, minding my own business driving home after work. I needed to pick up a few things for my daughter’s teacher appreciation gifts and the store I was going to just happened to be next door to a craft store. DARN! heehee. I found this fabulous stamp. And the reason I say it’s fabulous is because if I had to put my craftiness into a stamp, this would be it. It almost projected light and ahhhhhh sounds from the shelf. Crafting is my stress relief, therefore, I shall keep calm and stamp on. I also picked up a little jar of Zing embossing powder in HOT PINK. I envisioned what this card would look like the second I saw that hot pink embossing powder. I sped home and inked it right up and created this little gem. I used a Unity Stamp to emboss the chevron pattern onto the white cardstock and used Spellbinders to create my zig zag squares. A little bling on top of the crown, and voila! 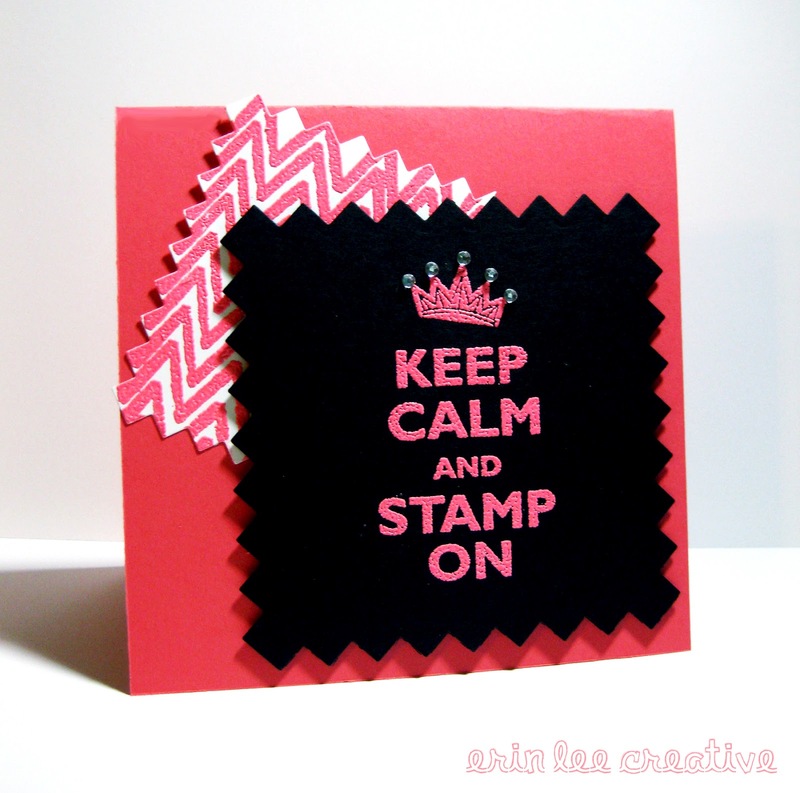 So keep calm….and stamp on my crafty friends!